The fast flowing Suwanee River. 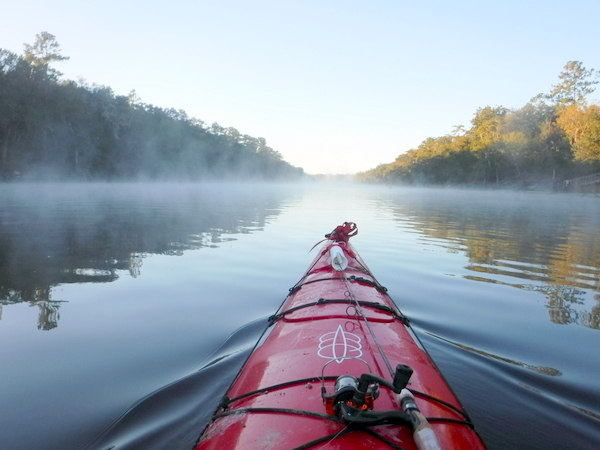 Florida's best river to paddle? Well I have come to the opinion that perhaps the Suwannee River is the best River to paddle in Florida. 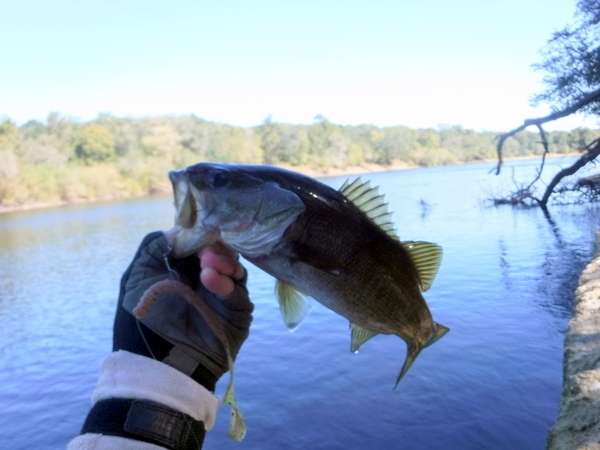 The Suwannee River is located about three hours north of Kennedy Space Center. The tannin stained river water flows fast compared to most Florida rivers. 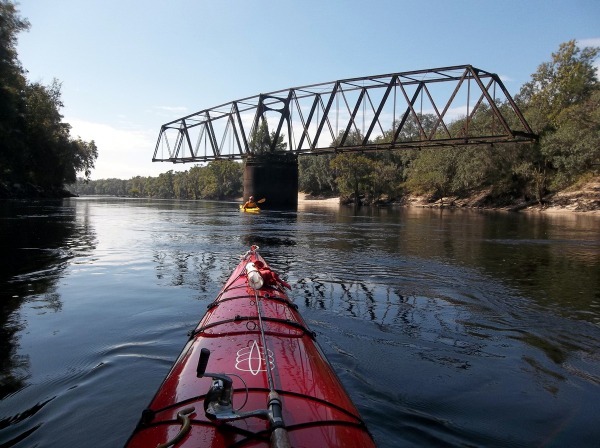 The River is deep but interspersed with rocky shoals that may not even be noticed during high water trips -however during low water trips, portage may be required when crossing these shoals depending upon the type of water craft one is paddling. At the base of these shoals lurk ancient armored fish that for unknown reasons love to jump straight up out the brown waters. When least expected a 4-5' long sturgeon will leap from the water creating a large and exciting splash! 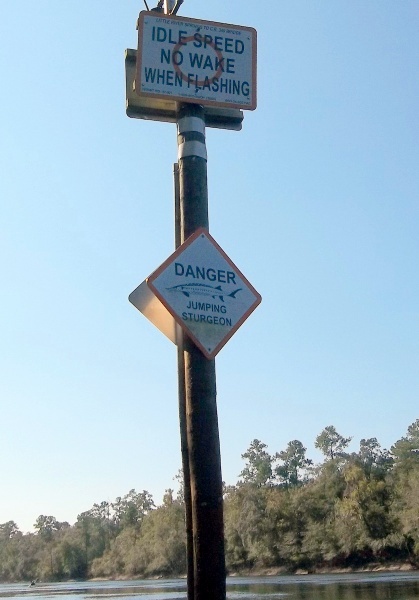 Signs placed by the state of Florida abound warning water craft of all types of the jumping sturgeon; however one never knows when these "older than the dinosaurs" fish will take their bountiful jumps. There is a fascinating wildness to the River. Not just the abundant deer and turkeys but that many of the River homes built sit on tall stilts, indicative of unpredictable savage flooding. I will make the claim that the Suwannee has the most springs of any Florida River. I actually cannot prove that is a correct statement however it certainly seems true as you paddle past stunningly giant springs, smelly sulphur springs and hundreds of very small to medium springs. Springs everywhere! Springs....during a paddle trip down the Suwannee River with paddle Florida -one of the evening entertainment sessions was about cave diving in the underwater rivers and springs that feed the Suwannee and it was explained that the huge, fast Suwannee River is nearly completely a spring fed River (omitting the River headwaters -the great Occanofokee swamp in Georgia and the feeder (spring fed) Withalhoochee River. 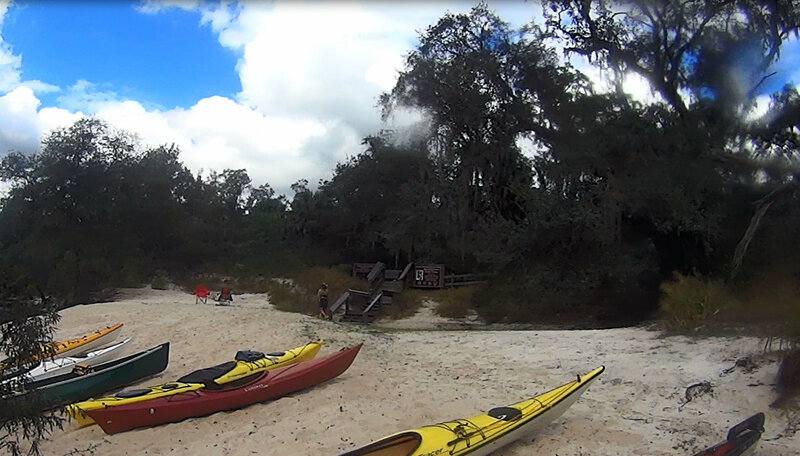 To paddle the fast Suwannee and to realize most of the River water had emerged from underground caverns is rather startling! In conclusion I just wanted to mention (and congratulate) the state of Florida for the money expended to create public "River Camps" for canoes and kayak enthusiasts. Strategically placed; these River camps for a few dollars offer a place to camp, hot showers, picnic tables and limited screened cabins. A few of these screened cabins and bathrooms are set upon stilts-once again pointing the savage floods that sweep the River ever few years. Thanks to the State of Florida and to Paddle Florida for some wonderful memories!